Ready to dive into the spectacular Dolomites World Heritage site? 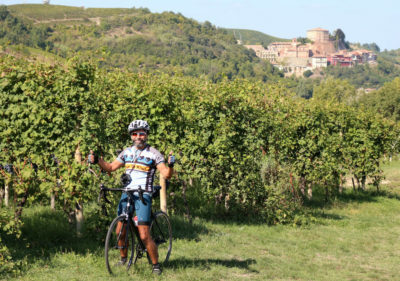 Embark on a pleasant bike tour through breathtaking mountain scenery, onion-domed churches, quaint mountain villages, orchards, vineyards and castles. The Dolomites were inscribed on Unesco’s World Heritage list since 2009. News of the event circled the globe quickly and soon millions of people knew about the Dolomite’s unique and spectacular landscape. 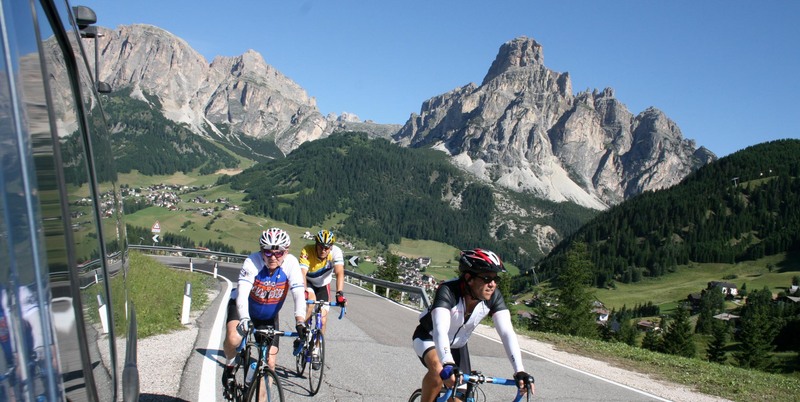 Explore one of the world’s most beautiful mountain ranges by bike: Pedal through Alpine pastures and picturesque mountain villages, Climb all the famous passes of Maratona delle Dolomiti as well as Giro d’Italia bike race, and ride to crystal clear lakes. Discover unknown wines grown in these high mountain valleys from the spicy Traminers to the fruity Teroldegos, savouring the local Tyrolean cuisine with meals at local farmhouses Maso and gourmet restaurants featuring mouth-watering speck, canederli, warm apple strudel with cream. Bike-fitting session – optional test ride on cycling path towards to Leinz, Austria - here atop Italy's rugged rooftop, a surprise awaits: a network of cycling routes and bike paths that keep us from traffic and allow us to ride with locals and tourists of all ages. From Italy to Austria, charming old-world villages and spellbinding limestone massifs. Explore the picturesque village: a Collegiata with big fresco, and a restored baroque church. Welcome Gourmet Dinner at hotel. 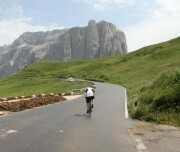 Today a first touch of Dolomite Cycling. Across Sesto and start your first climb to pass Monte Croce, now pedal downhill for 11 km through forest. Pass some little villages, after 50 km in Padola stop for lunch and at “Re del Gelato” to reward yourself. Back to hotel you can relax muscles dipping into the river skirting the garden: best therapy! 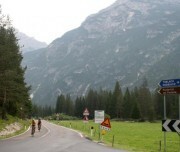 Today is the ride to main fancy town of dolomite Cortina. Form hotel you will take the flat bike path to Dobbaico to warm up. Once in the village you will take left and climb inside the forest and mountains. No words are needed to describe this tour, the remarkable land- scape speaks for itself: Tre Cime, Lago di Misurina with a view on the Sorapiss Group and Cortina, the pearl of the Dolomites, surrounded by the Tofane and the Cristallo Group. One of the best lake of dolomite is Misurina, unique panaorama adn with short extension is possible go nearby and admire the three peaks – tre cime di Lavaredo . 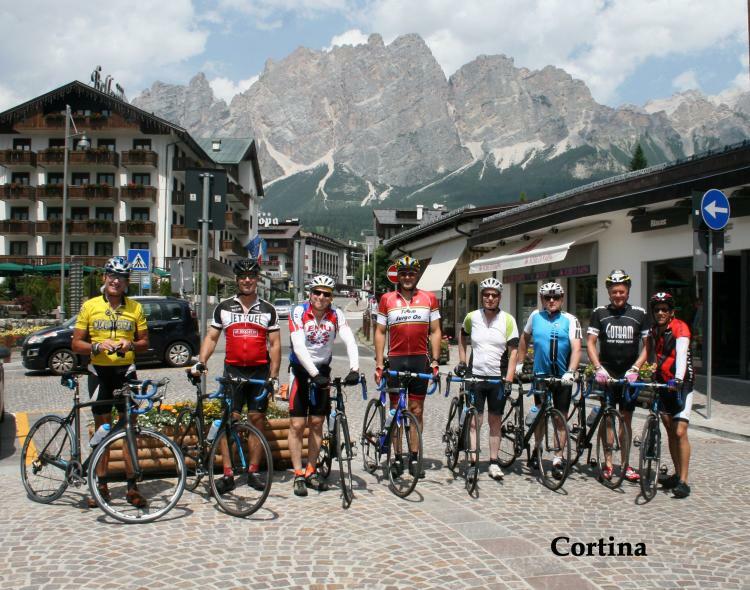 Back to Misurina now downhill to cortina – visit & lunch – back to San Candido on an easier route. 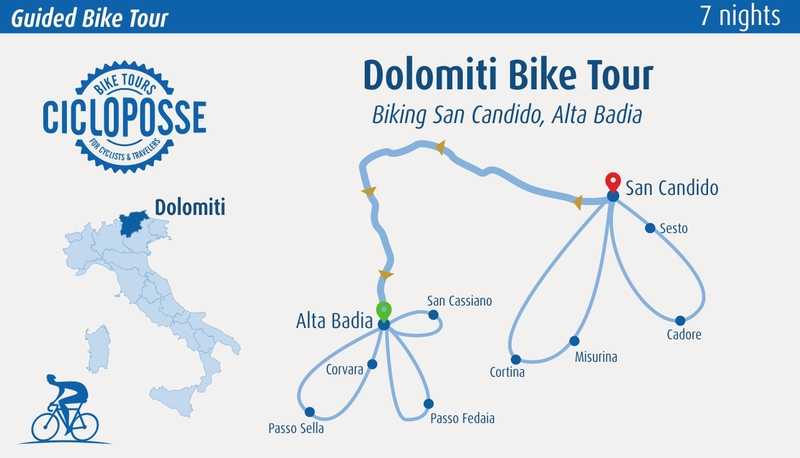 Start again on the bike path to Dobbiaco, Monguelfo, Valdaora skirting the lake – some km on easy gravel road to stay away from traffic. Once in Valdaora and cross the village start the climb to Pass Furcia. It is about 14 km uphill – breathtaking panorama – at bottom of Plan de Corones. Once at the top after 33 km of ride start the long downhill to Marebbe and Longega and now easy ride to Badia but is a traffic road so in case we arrange transfer to hotel (10 miles) Badia is an ideal starting point for road bike cycling. Its location at 10 km from the Dolomite passes gives you time enough to warm up those muscles before heading for the real slopes! 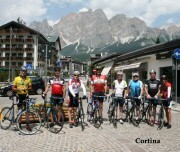 Corvara, Passo Gardena, Pass Sella, Passo Pordoi, Arabba, Pass Campolongo and ownhill back to Pedraces . 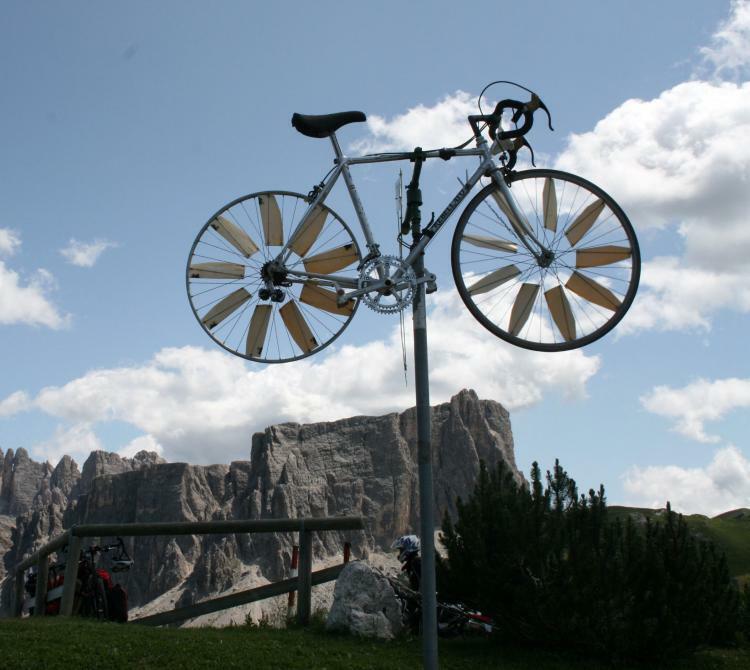 Let’s start with Sellaronda - This is the classic circuit around the heart of the Dolomites: it is definitely a "mustride" for those who love bikes and the mountains! You will be contending with four passes that surround the majestic summits of the Sella Group and lead to four Ladin valleys: Passo Campolongo, Passo Pordoi, Passo Sella and Passo Gardena. Corvara – villages famous in the bicycle world for the Marathon of dolomite – a race that takes place first week of July. Dinner at Runch Hof- typical ladina house. 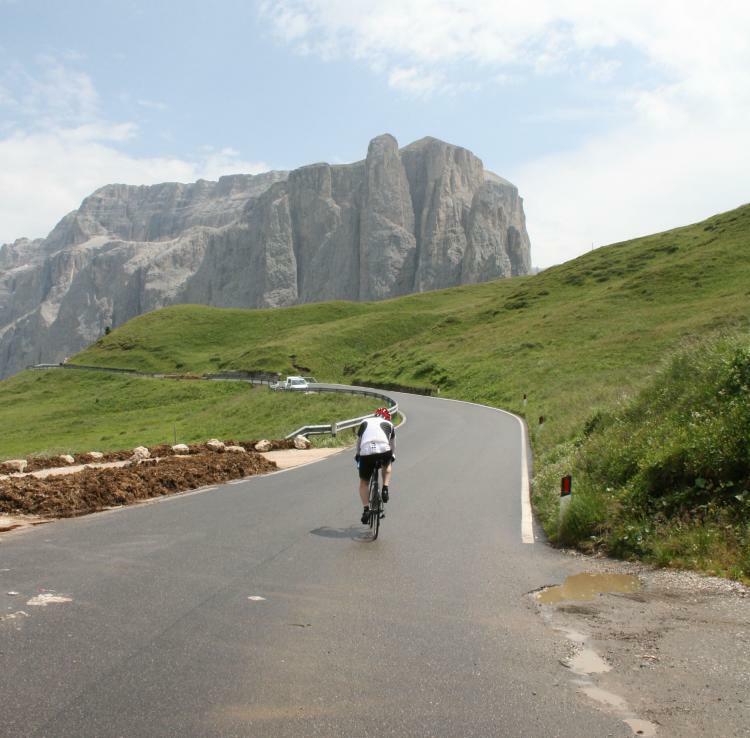 Bike Tour: this is a challenging circuit that covers various Dolomite passes, including Passo Fedaia -world-famous for the Giro d'Italia and because it is situated at the foot of the Marmolada alpine glacier. 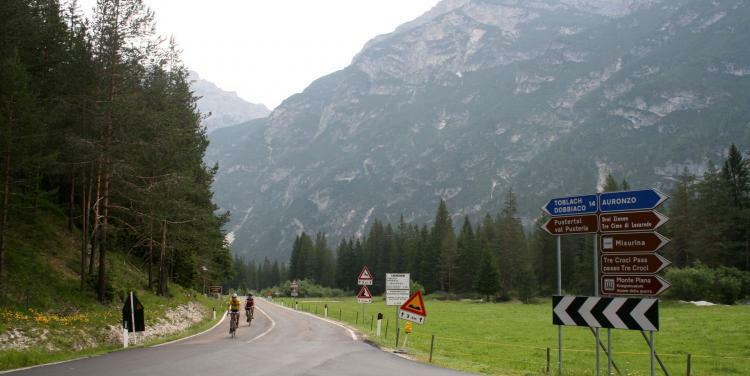 Tour: The circuit features two very challenging climbs: the first, from San Cassiano to Passo Falzarego; the second, from Selva di Cadore to Passo Giau, with a maximum slope of 14%. 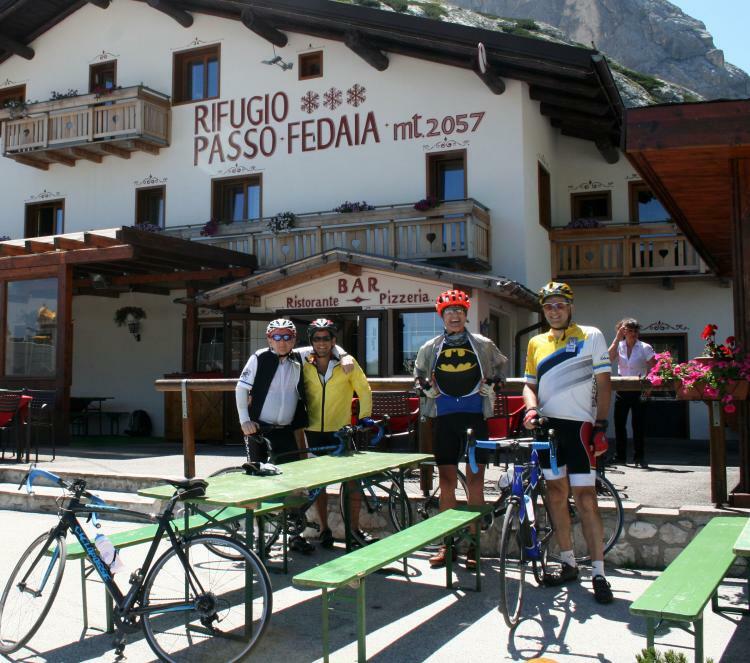 A highlight of this tour is the breathtaking 360° view of the Dolomites from Passo Giau. Farewell dinner! Airfare to Italy, lunches, alcoholic/non-alcoholic beverages, gratuities, travel insurance, laundry expenses and items of a personal nature. Hi Giuliana, I have finally found my way home and returned to work as of yesterday. I wish to thank you for the meticulous preparation and execution of our trip. We all have enjoyed ourselves very much. We all appreciated the level of attention both Marco and Gigi provided to every member of our group. The bikes, the weather, the roads and daily itineraries as well as the accommodation were all fabulous. I hope we will be able to organize more trips in the future. Best wishes and with many thanks!